Product prices and availability are accurate as of 2019-04-04 13:52:37 EDT and are subject to change. Any price and availability information displayed on http://www.amazon.com/ at the time of purchase will apply to the purchase of this product. Queens Palm: The perfect plant for cold gardens where a tropical look is required. 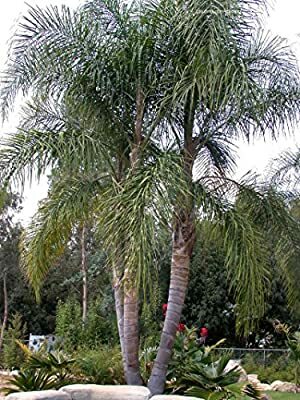 This particularly attractive palm with a smooth trunk, sometimes swollen around the middle, and lovely plume-like arching fronds is grown all over South Africa. Reaching a height of 12 to 15 metres, it is ideal for both small and large gardens. Grow in fertile, moist but well-drained soil in full sun. The leaves are 3 - 5 metres long, each with many linear, mid-green leaflets. Orange glanded green flowers are borne, usually in summer. The fruit is yellow and fleshy and 2 and a half centimetres in diameter. This is a palm with an identity crisis! A few decades ago the queen palm was assigned the name Cocos plumosa. During the late sixties and seventies most experts began referring to it as Arecastrum romanzoffianum. Now this queen has been placed in the genus Syagrus, the species name became romanzoffiana - hopefully Syagrus romanzoffiana will stick! Queen palm is tolerant but prefers enriched sandy soils. Fertilize twice a year in spring and summer with a fertilizer that contains micronutrients, especially manganese. A deficiency of this micronutrient results in a condition called "frizzle top" which causes leaves to look frayed and torn. This condition can be corrected by spreading a 1 to 3 pounds of manganese sulphate beneath the palm (amount depends on the size of the tree). Light: Full sun is best but will tolerate some shade. Moisture: It will withstand some drought but keep watered for best looks and fastest growth. Hardiness:USDA Zones 9-11. Cold damage appears at 25 F, the plant freezes and dies at about 20 F.
All seeds include germination and growing instructions.